The first step our experts will clean the roof of all leaves, twigs, branches, moss, fungus, and other debris. If we find excessive moss or fungus on any parts of your roof, we power wash them to eliminate this potentially deadly threat. 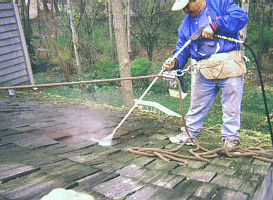 A cedar roof cleaning is essential to keeping your roof in excellent condition. Even if your roof has received the best care, it's still normal to find some cedar shakes or shingles that need repair or replacement. 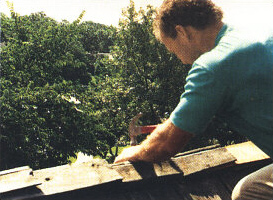 At our company, we take the time to check your roof carefully for any damaged, rotting, or missing shakes or shingles. We then replace them as needed, always using the same grade and quality as the originals. 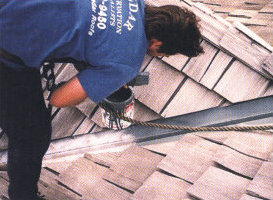 The third step in our cedar roof maintenance process became especially important to homeowners in the Midwest a few years ago when exceedingly high winds stormed through the area. Homeowner Betsy B. of Wheaton, Illinois, says several of her neighbors had cedar shakes and shingles "literally blown off their roofs." Her cedar roof, however, stood up to the storm without any damage. She attributes this to the fact that only a few weeks before the storm, our company had carefully refastened and repaired loose shingles on the roof as part of the cedar maintenance process. Shakes and shingles are not the only parts of your cedar roof that may need attention or repair. 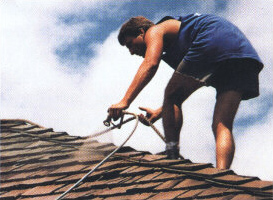 At our company, we offer a maintenance program that includes attention to your entire roof. This includes protecting your roof's galvanized steel valleys from rust by brushing on a rust-preventive primer. While we cannot guarantee against leaks, to help keep your roof watertight, our next step is an inspection of all caulking around skylights and chimney flashing. Whenever we find an area where the seal looks vulnerable, we re-caulk to potentially prevent future leaks. At our company, when we spray your cedar roof with a preservative, we make certain the rest of your property is not affected by it. 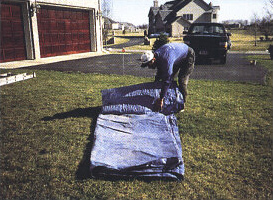 Thus, we carefully protect your landscaping, sidewalks, patios, and decks with hoses and/or tarps before beginning any spraying. Not all cedar preservatives are the same. At our company, we use Sta Brite®R. This top-notch, breathable, penetrating, water-repellent, and ultraviolet-resistant preservative provides superior protection. A water-based product, it's nature-friendly and environmentally safe. To provide the ultimate coverage, we power spray the preservative on your roof until the cedar is completely saturated. 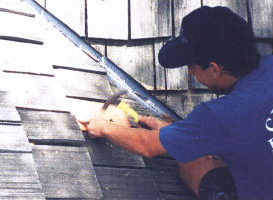 Throughout the application process, we give special attention to the ends of the shakes and shingles, which tend to be most vulnerable to decay. Sta Brite®R is available in three colors: organic brown spray, which provides a warm, rich, and earthy brown; medium grey spray, which matches the finely aged look that cedar will naturally develop over the years; and cedar brown spray, which is often described as the "new look" brown. Although the aesthetic value of the preservative is definitely secondary, it is very real. In fact, many homeowners who have chosen the organic brown say people comment on how new their roofs continue to look year after year. When your cedar roof has been preserved, it will be in excellent condition and look beautiful, and so should the rest of your home. At our company, we make certain that's the case. In fact, we guarantee our cleanup will meet with your satisfaction.